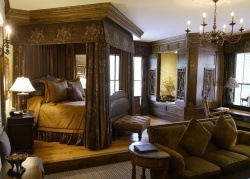 Shermans Travel | Luxuriate in Newport Now! Location, location, location—if that’s your mantra when booking a romantic seaside getaway consider The Chanler at Cliff Walk, a 20-room luxury inn with an enviable position at the start of Newport, RI’s stunning coastal walkway. And if you can escape to this historic city for a few nights before the summer sailing and social season kicks into gear you can enjoy superb service and amenities at affordable rates. The Chanler, a circa-1863 mansion that was gutted and lavishly refurbished in 2000, is a destination unto itself that also offers easy access to the best of Newport. Its 20 elaborate, romance-ready rooms—each with a gas fireplace, massive Jacuzzi tub, walk-in shower and heated bathroom floor tiles—are individually decorated with European furnishings, antiques and some of the sexiest, most comfortable beds imaginable: Manor Rooms, such as the blue-hued Williamsburg and sunny Greek Revival, are influenced by a distinct architectural period; Estate Rooms, such as the villa-inspired Mediterranean Suite and castle-like Gothic Suite, are larger with separate sitting areas; Signature Rooms, such as the Renaissance Suite and English Tudor Suite, ooze opulence and some have semi-private decks; Ocean Villas, such as Martha’s Vineyard and Nantucket, overlook the beach and feature private outdoor hot tubs and saunas; and Garden Villas, such as Peonies & Ivory and English Trellis, overlook the garden and have a private courtyard with hot tub. Just outside this oasis of calm lies scenic First Beach, where the surf is always up, and legendary 3.5-mile Cliff Walk, where you can join local dog walkers as you stroll past Gilded Age mansions built by Vanderbilts, Astors and Dukes. These include monumental 70-room The Breakers and tapestry filled Rough Point. (Note: Most of the walk is paved, but some sections are unpaved and others rocky so wear appropriate footwear.) Several of these mansions are open for tours—and are definitely worth seeing—so check Newport Mansions and Newport Restoration Foundation for details. All that fresh ocean air will stoke your appetites and The Chanler’s elegant Spiced Pear restaurant is the perfect spot to sate your hunger for innovative cuisine. Here, chef Thomas Duffy serves a contemporary menu using the freshest seasonal New England ingredients—such as seared dayboat scallops and Maine lobster cassoulet. For a real treat, splurge on Duffy’s nine-course Gourmet Tasting Menu ($390 for two, including wine). End your day with The Chanler’s butler-drawn bath; just ask and a candlelit, rose-petal-strewn tub for two will await when you return to your room (nightly rates from $259, including breakfast, through June 30, or book the Culinary Duet package and get two nights’ accommodation, plus daily breakfast and a three-course dinner for two at Spiced Pair plus a three-course dinner for two at historic White Horse Tavern, from $944, May 14 to June 30).